The organic and fair trade certified “Nib Brittle” bar featured here contains 65% cacao which is a little low for high end dark chocolate. The flavor isn’t any lower though so if you’re not a percentage snob and just want an unique treat that won’t mark you as someone who buys chocolate at gas stations this could be the one for you. The flavor is sweet and the texture gives the impression of raw sugar in the mix. There’s a slightly woody after taste which isn’t super appealing but is easily overcome by taking another bite. The really good news is that listed under “Nutrition Facts” it says serving size is one bar. That means when your girlfriend asks you to share you can say no based on a legitimate fear of being malnourished. Although, I’d recommend surprising her with a bar of her very own so you don’t end up sleeping on the sofa. Theo caught my eye again. 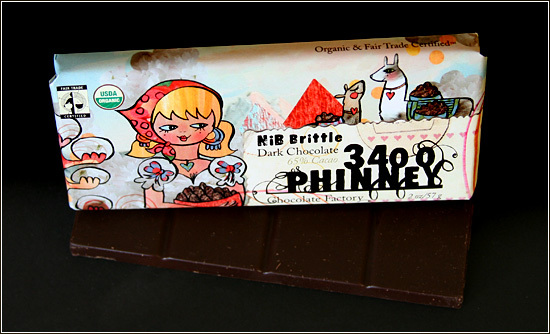 This time with a series of whimsical illustrative wrappers around flavored dark and milk chocolate bars named for the address of their factory in Seattle. The packaging is more fantastic work by Kitten Chops so you can order the type of chocolate you like comfortable in the knowledge that it will attract favorable attention on your desk at work amidst all the screen printed concert posters and Kidrobot collectables. You can learn more about Theo’s full range of products by visiting their website (which despite my recommendation they haven’t let Kitten Chops redesign yet. Which is not only too bad for visitors but means my opinion holds considerably less sway in the national design community than I had led myself to believe. Available through The Meadow or Amazon.com. Is there anything you can’t buy through Amazon? mmmmm! try espresso sea salt on the chocolate with some almonds.